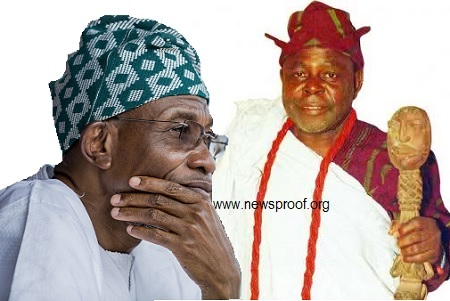 Ifa priests, under the aegis of Traditional Religion Worshippers Association, Osun State, have disclosed that the successor to incumbent Governor Rauf Aregbesola in 2019 has been revealed to them through divination. Speaking in Osogbo, a seasoned Ifa priest, Dr. Oluseyi Atanda, who is also the Secretary General of TRWASO, said that the next governor of Osun was revealed in the New Year 2018 Ifa divination for Osun State by the traditional religion worshippers association. Atanda maintained that the divination, among others, would come to pass. “Otua-sa is the Ifa corpus that brings message and the sacrifice was observed immediately after the Ifa consultation for the peace and harmony of the State of Osun, her citizenry and Nigeria as a whole; the pacification is being carried out and sponsored by Osun State TRWASO,” he said. Atanda, who did not name the purported successor to Aregbesola, noted that the role of Ifa was important in the administration of a state, adding that this was why the Ifa oracle revealed to its priests so many things that would happen in the future. He said so many divinations made last year in the state came to pass, stressing that Ifa revealed last year that there would be division among political parties and prominent politicians in the state and the divinations were currently manifesting. Atanda, however, advised governments in the South West part of the country to ensure that Yoruba language did not go into extinction. The priest said Yoruba language should be made compulsory in both public and private schools to enable the children to understand and speak it always, with less emphasis on English language.